Lookingto have a new fantastic garden or maintain your existing one. 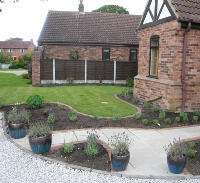 Sanders Landscape Services, York offer you fixed and a complete gardening service with over 28 years of experience having been trained at Askham Bryan College and are confident you will be delighted with our work. 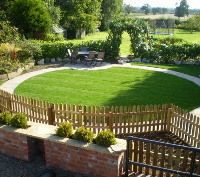 Specialising in turfing, driveways, paving, paths, pathways and patios in Indian stone, block paving and gravel. We also cover all aspects of tree work including pruning, chipping, stump grinding and stump removal. 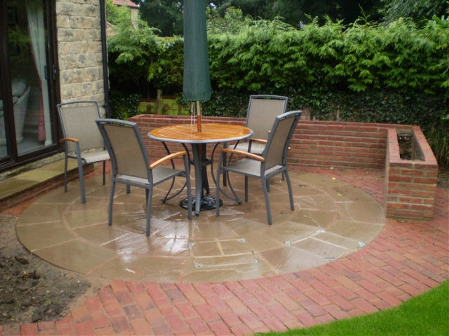 Based near Poppleton York our landscape gardening services include fencing, pergolas, garden design, garden clearance and garden rennovation. Whatever your garden or landscape needs hard or soft landscaping, garden maintenance, water features or garden design call us so we can discuss your requirements in detail and provide you with a bespoke competitive quote. important part of the structure and design of a garden. The hard landscape in your garden should be good to look at and in keeping with your house and the rest of the layout of the garden. Soft landscaping is the plants, trees, shrubs and flowers that go to make your garden the interesting place it is. Whether your garden has been designed and built by Sanders Landscape Services or you have done it yourself Sanders are able to offer a garden maintenance service. All maintenance work is charged for per man hour. Low mainenance gardens can be designed to ensure a minimum amount of maintenance without losing the look and feel of the garden. Water features can come in many shapes, styles, designs and sizes. 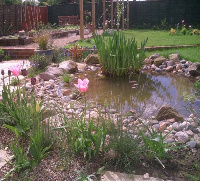 We have much experience of designing and building water features and can offer design and advice for installation. Whatever size of water feature you require Sanders will ensure that you get the most enjoyment and benefits from your investment. You may be looking for just a few ideas to enliven a tired spot, a scheme for a small part of the garden, a planting plan for a border, or a complete design. Any, and all, are possible . The first step is to meet and discuss your space to explore and understand your hopes and dreams for it … how we can bring skills and experience to help you achieve this potential. Find out more about our landscaping services here. Hard and soft landscaping in the York area. 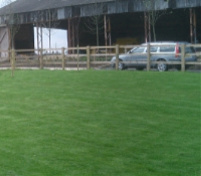 Garden maintenance of all sizes in and around York. Water features for all sizes of garden in the Yorkshire region.